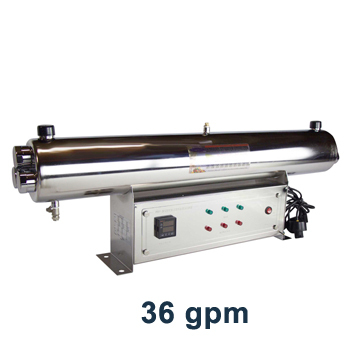 Commercial / Whole House UltraViolet Water Sterilizer is great for well water where reduction of bacteria and viruses is required. 24-84 GPM (gallons per minute) flow. 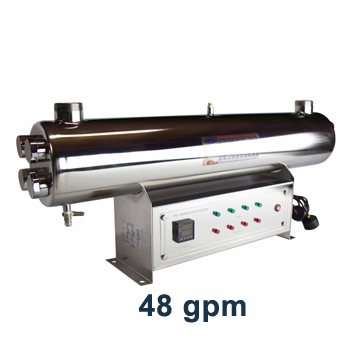 A great addition to commercial water filtration system where a reduction of bacteria, viruses and protozoa is desired. This UV Disinfection System is manufactured in 304 stainless steel and comes with 1" and up to 2.5" water line connectors. 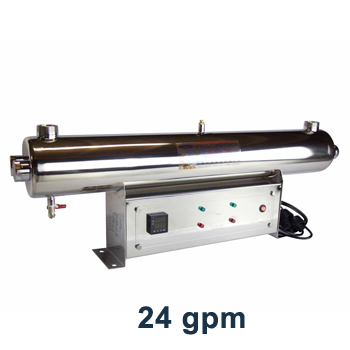 The hard glass germicidal UV lamps provide an economical way of treating water where a 99.99%+ reduction of bacteria and viruses is desired. 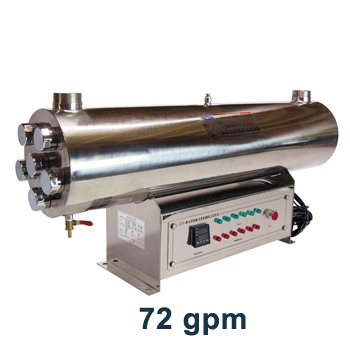 This process is accomplished without adding any harmful chemicals to your drinking water. CQE-UV-00105 1" 24 110 W 2 6"x14"x40"
CQE-UV-00106 1" 36 165 W 3 7"x14"x40"
CQE-UV-00107 1.5" 48 220 W 4 8"x16"x40"
CQE-UV-00108 2" 60 275 W 5 9"x18"x40"
CQE-UV-00109 2" 72 330 W 6 9"x18"x40"
CQE-UV-00110 2.5" 84 440 W 8 9"x18"x40"